Finance available, get in touch for a quote. Powered by a legendary supersport engine. Armed with the latest technologies. Tuned to command the streets. Built to reign supreme over naked sport bikes. The GSX-S750 is a true apex predator. Inherited directly from a GSX-R supersport machine, the powerful 749cc four-cylinder fuel-injected engine is specially tuned and refined to maximise its potential on the streets and on winding roads. Cutting-edge technologies from the legendary GSX-R series control engine management. There are two GSX-S750 variants available, the GSX-S750Z Phantom model comes with blacked out bodywork, black forks, silencer and chain adjusters. 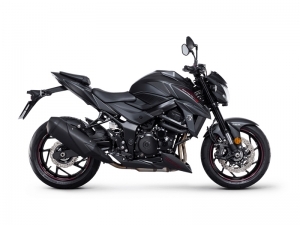 The GSX-S750 comes equipped with some of the most advanced rider technology available, including Traction Control², Low RPM Assist and Suzuki Easy Start System. From the bold, upswept lines of its crouched stance to the aggressive styling of its new headlight, fuel tank and body trim designs, every aspect of the GSX-S750 speaks of the raw power, predictable performance and functional beauty inherit to a true apex predator. It invites you to climb on and make it your own, while you dominate the roads. Preferred Time for your test ride? Do you have any general enquiries about the bike?